With the hectic pace of modern warehouse operations, even the best fulfillment teams struggle with maintaining high levels of customer service while avoiding mistakes or missing details that drive up shipping costs. Six of the most common situations can drive you nuts, showing up in hot spots and bursts even while your team continuously works to squash them in your operation. 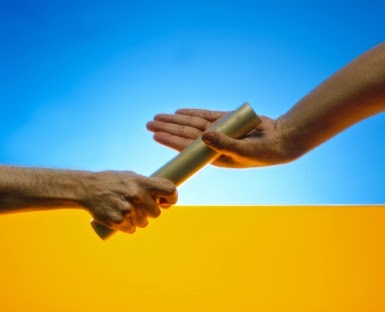 Pacejet helps put more systematic governors in place to help you monitor and manage these common scenarios more easily, better mitigating their effects to keep your profits heading in the right direction. One of the easiest ways to drop a little extra unrecoverable cash on shipping is to include services in the shipment processing that aren't accounted for in quotes provided to customers. In the example shown below, adding a delivery confirmation charge at the last minute introduces an extra $4 service fee as just one small illustration of a special carrier service to help improve customer relationships. One technique that Pacejet uses to help you manage these better is to integrate the service selection and use throughout the entire order taking and fulfillment process. 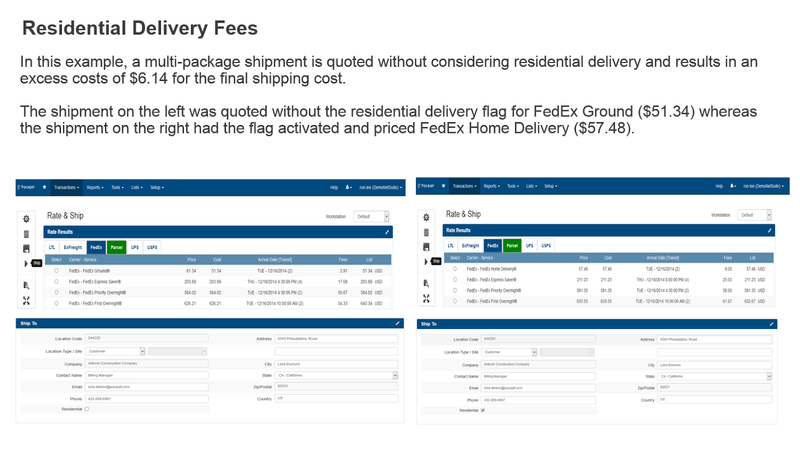 For example, if you are a NetSuite ERP user the standard Pacejet integration bundle provides a Delivery Confirmation service checkbox in areas like Sales Orders and Fulfilments so these services can be attached right up front and all quoting and shipping use-cases include them in estimates, display the extra costs to users, and support confirmation with customers. 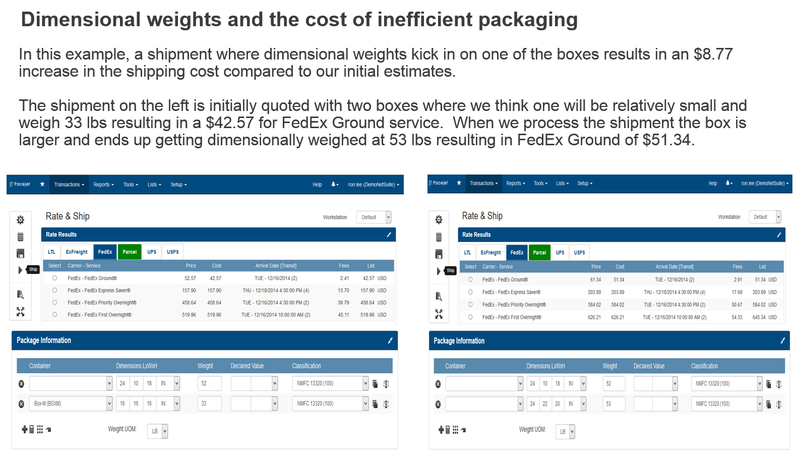 Incorrectly estimating shipment packaging in upfront sales quotes is a much tougher problem to solve but it can have a very significant impact on cost overruns in shipping. 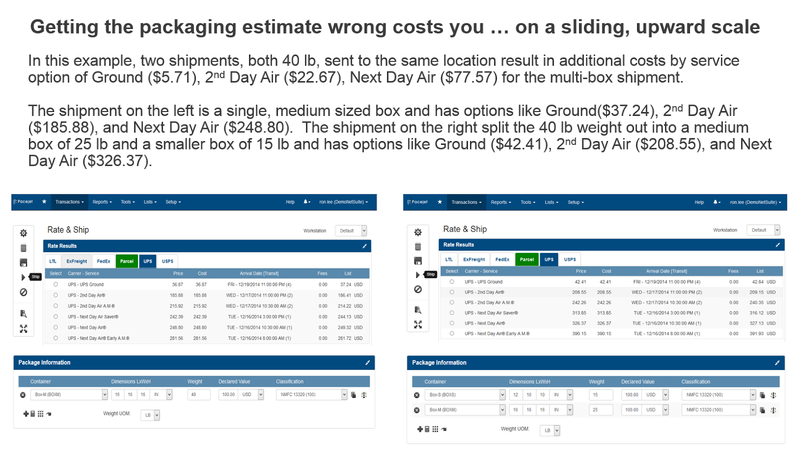 In the example shown below, shipping the same weight of items in two boxes rather than one box drives up the cost of shipping by $5.71 for Ground but a whopping $77.57 for next day air. The Pacejet answer here is to introduce several levels of data integration and automation to estimate packaging during order-entry and on e-commerce websites where users and systems typically can't easily account for expected shipment packaging. The key to effectiveness is that the process doesn't have to perfectly account for actual shipment packaging in the estimation process (which could be very hard to achieve for some types of product mixes), even an 80% accuracy rate on estimate packaging can move the needle on savings significantly. The impact of new carrier dimensional weight rules is definitely getting lots of attention in the press, with some calling it the "largest price increase in history". The example shown here demonstrates how an extra $8.77 in shipping costs can be introduced with dim weight issues as just one way to see the problem in action. The Pacejet solution for dimensional weight issues doesn't really introduce any special features or technology but rather just employs moving to standard best-practices of integrating container data with dimensions throughout your process of quoting and shipping to allow dimensional weight calculations to be automatically handled by the standard process. 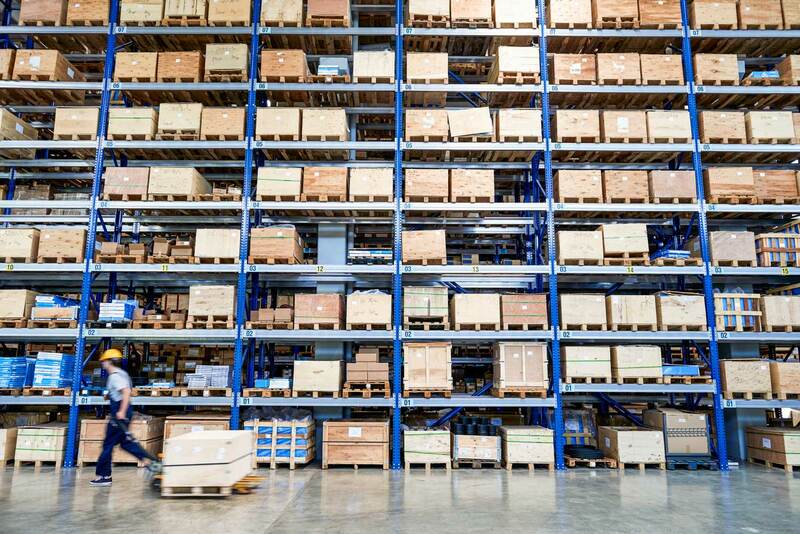 With e-commerce and multi-channel sales continuing to grow at astounding rates, more and more shippers are dealing with an "unknown address status" of new customers coming in from various sources. If you don't know whether an address is a residence or a commercial business, how do you systematically pass along the residential surcharges, like the extra $6.14 in the example shown below? The Pacejet answer to this problem is first to integrate the Residential Service indicator throughout the process like other services so it can be easily added where known. But as a secondary and more active way to handle residential services, Pacejet offers an address verification and correction service which can look-up address status in real-time, discover if it's commercial or residential, and automatically trigger the service only where it's needed. 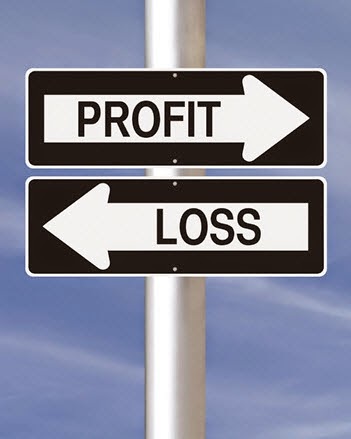 Although carrier systems and API's have recently provided much better real-time verification of billing accounts and numbers, it's still possible to miss approvals, use the wrong accounts, forget to use third-party billing, or otherwise affect the process to end up with a charge-back fee of $12.35 (for example) and possibly be charged the cost of the shipment as well. The Pacejet solution for billing account management is to provide standard settings in your ERP customer master which can hold carrier account information and then transmit it directly through the shipping process. Users still have the option of entering or overriding this detail in shipping but by tying it directly to customers you can improve your chances of consistently using it every time you ship to a customer. For multi-channel sellers where customer data is coming in from many different online sales channels, dirty address data is very common and, of course, can cause all kinds of challenges in shipping. Even simply things like an incorrectly entered zip code by a customer can end up costing you a $12.35 chargeback fee if the carrier has to correct the mistake during transportation. The Pacejet answer here is to introduce a real-time address detection and correction service which can be used to automatically verify addresses at the "street level" and correct any mistakes before you start using them. For shippers who need this level of automated scrubbing, it can mean thousands of dollars in savings per month. Most shippers are very aware of these common shipping service scenarios and the types of cost overruns they can introduce during order fulfillment. The hard part is really how to introduce better systems and process controls that make it easy for super-busy, stressed-out warehouse workers to handle these scenarios consistently with as many orders as possible. That's where Pacejet tools, automation, and ERP integration can make a difference. Interesting in learning more? Follow our blog via email for automatic notifications of new articles, follow @pacejet on twitter, drop us an email at info@pacejet.com or call 877-722-3538. We are here to help.